Since 1974, I&M Machine & Fabrication Corporation has been a rapidly growing metal fabrication company, located in the heart of the Midwest at St. Joseph, Missouri, totaling more than 265,000 square feet, and still expanding. 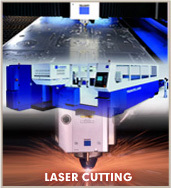 I&M is home to the most technologically advanced machine & fabrication equipment available in the industry today. This advanced technology, along with our dedication to quality, has made I&M the first choice for a great number of companies utilizing Metal Fabricating, Precision Machining and Powder Coating Services. Our facility is filled with over one hundred highly trained employee's who take pride in the services (from development to finished product) we offer; such as Computer Aided Design Assistance and Auto-Nest Programming, to lower material costs so you can "Watch Your Profits Soar".